Went out for a bit of a walk this evening and saw this chap padding around Fitzroy Square. Looks like he'd just come up from a spot of dinner on Charlotte Street. Probably works in the media. There've been foxes in London since the 30s, and I can imagine Fitzroy Square might suit them quite well. People rarely seem to go in there and there's access to quite a bit of open space and food around. Has there been a children's book based on urban foxes yet? seems the perfect topic. Of course I'm such a poor naturalist that it's probably a large cat or feral dog or something and someone'll tell me I'm an idiot. That's def a fox, I've hit enough of those buggers in my car to know! Believe it or not but in some parts of Australia you get money for turning in a dead fox - they do a lot of damage to our natural fauna. 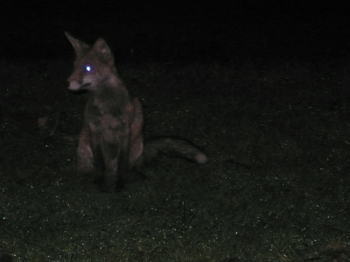 it seems scary to encounter a fox. I have foxes at the end of my garden - they've been getting frisky lately (if you've never heard a fox's mating call, consider yourself lucky), so hoping for cubs soon. I recognise him. He's a planner at Saatchi. His name is Dave. I can remember the horrors of Bunce and Bean to this day - transpose their features onto some SoHo dwellers and you're pretty much set. I don't think Wes Anderson will go for the 'crack fox' (as seen in the Mighty Boosh) model for his film version of Fantastic Mr Fox. A much safer bet will be on Bill Murray or Owen Wilson playing the fox, dry humour and pastel colours galore. Foxes are great, I just wish they wouldn't make that 'eeeeeiiii' noise.